If you’re thinking about adding a porch to your home, you’ve dreamed about a beauty. It’s perfect in your mind. The porch design is flawless. So it has to be perfect in reality. And for that, you need to pick the right porch builders. Quality porch construction is an essential part of a home’s footprint. It offers a great outdoor living space. It brings the promise of fresh air and gorgeous views. A porch is a perfect place to entertain for parties, to host special events, or just enjoy a family dinner under the stars. With the right design and porch construction it can become an attractive center point of the home. A most perfect place to relax. With porch construction from Archadeck of Delaware, our porch builders build out your home with a stylish new custom porch. Our builders are ready to serve you. We service most Delaware towns and cities. Newark, Claymont, Hockessin, New Castle, Montchanin, Rockland, Wilmington, Winterthur and Yorklyn to name a few. 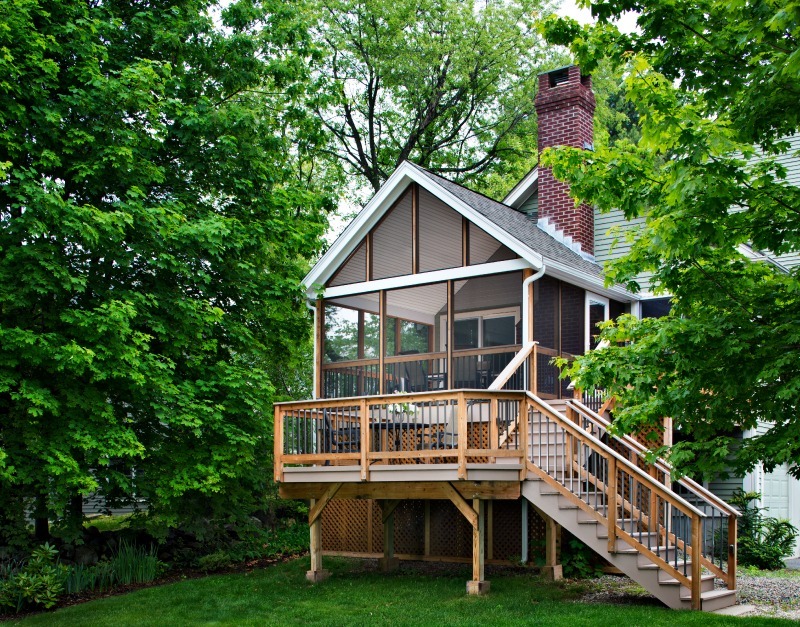 Regardless, we’ll come to you and help make your perfect porch a reality. Our versatility relies on our ability to adapt to your needs. Archadeck porch builders offer a wide range of materials that allow us to customize your porch. Archadeck takes even the most basic, standard porch design and turns it into something unique. Something that’s simply you. Our materials range from stamped neutral tone concrete to red brick pavers, gray flagstones, stained woods, and more. But more than just the materials, we offer design options that fit your home. We can handle pool wraparounds, terraced patios, and flowing, home-embracing porch designs that incorporate your existing or desired fixtures, including a built-in barbecue, planters, fire pits, benches, garden spots, or fireplaces. You can tell a porch doesn’t fit the home when the materials don’t match and the porch appears tacked on like a half-thought-out accessory. However, the opposite is true as well. A well done porch shines through for all to see. We don’t want your porch design to be a home fashion disaster. Count on Archadeck because quality and top notch work matters. Ready to make that porch of your dreams a reality? Ready to get to the next level? Have questions you need answered? To get started on your porch design, call us at (302) 455-2426. Our designers are be happy to give you a free design consultation, and discuss your needs for building an attractive porch that is the envy of any homeowner.